Description: Our calendar printing service gives you desk calendars printed in full colour. Supplied flat, simply fold twice to sit neatly on a desk. Our desk calendars are printed in full colour on eco-friendly paper from sustainable sources. If you need your desk calendar printing sooner, contact us to discuss a quicker delivery time. What can printed desk calendars do for me? Desk Calendars are ideal promotional tools to keep your name, message and contact details in front of your audience 12 months a year. They can be giveaways to your loyal customers and they are also ideal for charities and clubs. You can also order desk calendars for your company to keep them on your employees desk so they will not forget your motto and the company's mission statement. 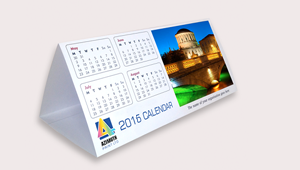 Azimuth Print, the UK's premier desk calendar printer offers a cheap, high-quality desk calendar printing service. We can print tent desk calendars in A4 (297mm x 210mm) size, if they are folded one side of the of the desk calendar is 210mm x 90mm. Our desk calendars are supplied flat, but they can be easily folded twice to sit neatly on a desk. You can either send us your own artwork or commission our designers to come up with a great look for your printed desk calendars for an extra charge. If you need to make small changes to your copy and design, we can take care of these at no extra cost, while larger amendments to your desk calendar can also be made for a fee. To find out more about the UK's premier desk calendar printer, just get in touch for a quote or for answers to any questions you might have about our desk calendar printing services.